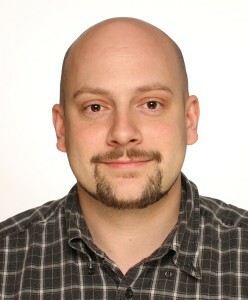 Jan Dienstbier graduated from Charles University, Faculty of Mathematics and Physics (PhD. in mathematical statistics) and Faculty of Arts (Master in medieval history). Currently he continues his studies in the Faculty of Arts of the Charles University as a PhD student at the Department of Art History. His PhD thesis explores Czech mural painting in the 14th and 15th centuries, and its relation to the court art of Wenceslas IV. Among his scientific interests are medieval mural paintings, court art, profane motives in medieval folk art and Latin epistolography. In my project, which focuses on the Latin epistolography of Henry of Isernia (the theme of my master thesis), I edit a selection of Henry’s unedited letters, contained in manuscript ÖNB 31343 – a fifteenth-century Latin manuscript. Occasionally, this necessitates working with other manuscripts containing letters of Henry of Isernia and related letter formularies – Latin manuscript written in 14th and 15th centuries. Dealing with mural paintings I often work with Latin epigraphic inscriptions from the 12th to the 16th centuries.